Let It Be: A Celebration Of The Music Of The Beatles is returning to the stage in 2019 with a series of new tour dates announced in a year that marks key anniversaries in Fab Four history. This year marks 50 years since The Beatles took those infamous steps across the pedestrian crossing outside EMI’s Abbey Road Studios in London, which went on to become one of the most famous album covers of all time. Sadly, it also marks the 50th anniversary of the group playing together for the final time with a rooftop performance on top of the Apple Corps building in London’s Savile Row. 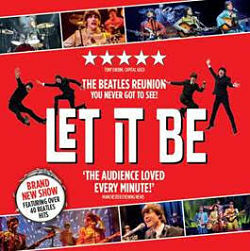 The acclaimed concert, which features an Let It Be Part II reunion concert, proved such a hit with audiences and critics alike when it was premiered last year and a sell out European Tour, that it is now returning for a new UK Tour through Spring 2019. Let It Be is a celebration of the iconic music of The Beatles and has already been seen by more than two million people worldwide, including a run in the West End and two UK tours. Beatles fans are invited to join John, Paul, George and Ringo for an unforgettable night of live music. The cast will comprise Emanuele Angeletti (Paul McCartney); John Brosnan (George Harrison); and Ben Cullingworth (Ringo Starr) all resuming their respective roles from the previous tour. Richard Jordan as John Lennon completes the Fab Four line-up. The band will be joined on stage throughout the tour by musical director Michael Bramwell on keyboards. In a twist from the original Let It Be show, Act Two is set a decade after The Beatles went their separate ways. It gives fans a rare glimpse of how the Fab Four could have Come Together once again to perform – and is not to be missed. Audiences are taken on a memorable and unique step back in time to the reunion concert taking place on 9 October 1980 – it’s John Lennon’s 40th Birthday. This is the ultimate concert that never was. The band reunite for one night only, just Imagine.